We hold expertise in offering a comprehensive range of Laboratory Equipment such as Laboratory Smoke Density Tester, Melt Flow Index and Dart Impact Tester from India. Voltage Supply 230V, AC, 50Hz. 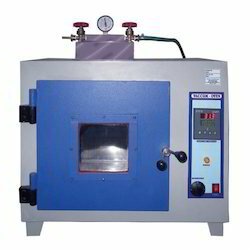 This Vacuum Oven are used in the laboratories of Biomedical & Pharmaceutical industries. These ovens are acknowledged for their easy use and can be tailor-made as per the requirements of the customer. Vacuum Ovens are double walled. Inside Chamber is made of thick stainless steel 304 Quality. High-grade glass wool insulation between the chambers to avoid heat loss. Uniform drying under vacuum. 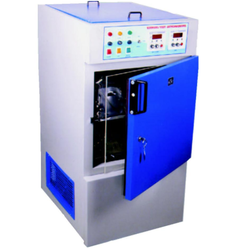 The vacuum chamber is wrapped with high-quality heaters for quick and uniform heating. The door has a thick tempered toughened glass window. Perfectly sealed with silicon rubber gasket for observation without disturbing thermal condition. Proper door alignment to ensure excellent Vacuum performance and operator’s safety. Positive screw to tighten the lid to obtain the perfect seal. Fitted with diaphragm valves and vacuum gauge. Control panel with temp. Controller Switches and indicating lamps provided on the front panel. Available in the circular chamber also. Vacuum control and relief valves located on the front of the unit for convenient monitoring. Humidity Chamber provided are highly demanded and applauded by our esteemed clients all over the globe. Excellent in quality, user-friendly, economical, durable, reliable, corrosion proof are some of the positive attributes of the offered range. Moreover, we source these range from certified manufacturers after thoroughly inspecting each of the chargers on various predefined standards. Additionally, we are supplying these Humidity Chamber at affordable market rates. A key lockable insulated door having positive door gasket seals doom perfectly. Vertical air circulation ensures temperature and RH uniformity. Double walled construction inner chamber S.S. and outside of Mild steel beautifully powder coated. Low-pressure Boiler which generates steam for chamber humidification. Most accurate and reliable chamber for long term high temperature and RH testing. The chamber with modular removable shelves made of S.Steel. Over the years, our firm has gained immense expertise in supplying and exporting Constant Temperature Oil Bath. At the facilities of our vendors, it manufactured using premier-grade components incorporating advanced technology. We have a team of highly experienced quality controllers, who check the offered machine on different quality parameters to ensure flawlessness. 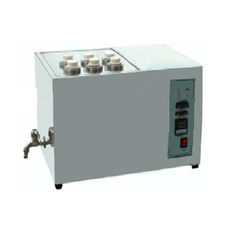 Offered Constant Temperature Oil Bath is integrated with easy controls and acclaimed by clients for good quality. Rectangular Hot Plate is fabricated using mild steel or highly polished stainless. The body is made up of thick mild steel and duly finished with powder coating. The heat is controlled by three position rotary switch and is offered with an indicator lamp for mains. Temperature is controlled by energy regulator.